Shiva Industries offer vast range of Lockout Tagout Kit. 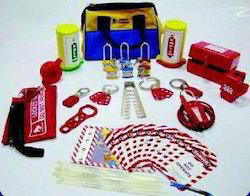 We are the leading supplier of Lockout / Tagout Kits made from high quality material at competitive prices. 1. Vinyl Coated Hasp - Small - 1 no. 2. Vinyl Coated Hasp - Premier 1 no. 3. Jacket Padlock with Regular Shackle - 1 no. 4. Jecket Padlock with Long Shackle - 1 no. 7. Writing Pen -1 no. 8. Lockout PERSONAL POUCH - 1 no. 3. Scorpio Tow Way Hasp -1 no. 4. Plug Lockout -Small -1 no. 5. Plug Lockout -Large - 1 no. 7. Gate Value Cylinder Lockout - 1 no. 8. Large Size Plug Cover - 1 no. 10. Pneumatic Lockout - Straight - 1 no. 15. Writting Pen - 1 no. 16. Lockout Booklet - 1 no. 17. Screw Driver - 1 no. 18. Cylinder & Pnuematic Kit Lockout Bag - 1 no. Looking for Lockout Tagout Kit ?